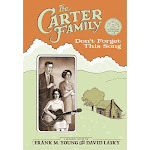 Frank and I are honored by the nomination of "Carter Family" for a Golden Toonie at Cartoonists Northwest's Toonie Awards. It shares the nomination with graphic novels by Donna Barr, Ellen Forney, and Mark Rahner. We'll be attending the ceremony on Saturday in Seattle.